Asian Journal recently did an article on me regarding my latest projects and specifically, my Sulat ng Malansang Isda (Writing of the Stinky Fish) documentary. This is a follow-up to a 2009 interview that can be read here. If you can’t get a free copy of the newspaper, read the article here. I’m featured in the November 13-19, 2009 issue of the Asian Journal – Filipino American Community Newspaper, Northern California edition. 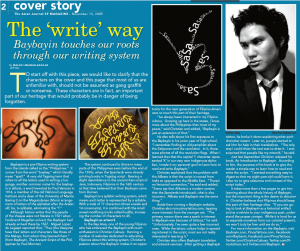 The Baybayin cover story is for the “Something Filipino” section.